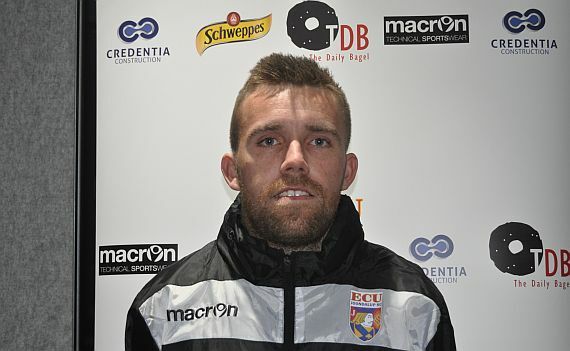 New ECU Joondalup signing Jayden Drummond will be out for six to eight weeks after breaking his leg after crude tackle in the 3-0 win against Sorrento two weeks ago. The midfielder returned to the field in the game and trained all week, and played 90 minutes at Armadale on Saturday, but with the pain in his leg not going he went to the doctors and had x-rays and found he had fractured his fibula just above the ankle. “Still a bit of a shock, it hasn’t quite sunk in yet,” Drummond said. “I knew something wasn’t right, but I’ve never been one to sit out just thought it was a really sore bruise, so being stubborn as I am I thought it was nothing but I thought I’d give in and get some piece of mind. Jacks Assistant Coach David Tough said it terrible news for Drummond, who has settled in well at the club after joining from Sunday Premier League side Kingsley. “He’s been a breath of fresh air at the club on match days and training, his enthusiasm and work rate has been second to none and wish him a speedy recovery,” Tough said.